The Indy Hostel i Indianapolis, USA : Boka nu! 50% of booking charges will be collected if notice of cancellation is provided less than 21 days before expected arrival. Clean, Comfortable, Cozy, & Affordable! Located just north of the city center in a quiet neighborhood, the Indy Hostel is ideally placed along a bus route leading directly to bustling downtown Indianapolis. 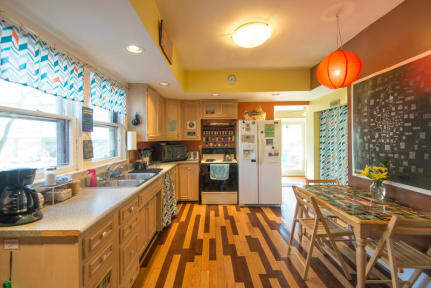 Within walking distance is the nightlife, dining, and culture-filled Broad Ripple area. Just behind the hostel is an entrance to the Monon Trail, a 30+ mile recreation trail that is perfect for getting around Indy by bicycle hooking up with a network of other trails. Hostel accommodations include various room styles: dorm rooms, private rooms, and a family room. Our common areas are a great way to relax and meet fellow travelers. After a day of sightseeing, watch TV in the lounge, use the computer room with WiFi to upload your pictures, or curl up with a book in the library. We also have a common kitchen and an outdoor patio with BBQ grill for preparing your own tasty meals. We pride ourselves on being one of the best hostels in the States, we hope to see you soon!. NOTE: Our Private Room prices are listed for 1 to 2 people. Please expect an additional $10 per guest after 2. Check in Hours: Please arrive for check in between the hours of 2 PM and 10 PM - if you must arrive later, please call ahead to make special arrangements.